I've been a huge fan of Articles of Society denim since I discovered the brand last fall (I'm wearing some of my other pairs in posts here & here), but this pair of jeans is by far my favorite so far. I love my AG distressed skinnies that you've seen so much on here because the fit is great and the stretch is really comfortable, but I can honestly say that I like these every bit as much and they're less than 1/3 of the price. The founder of AOS wanted to create a premium quality denim line at an affordable price point and I truly believe that they have. I can't recommend them enough! This pair just debuted at Nordstrom during the anniversary sale and the price point is so good. I think the wash and distressing are perfect for both summer and fall too! These would look so cute with anything from a white off-the-shoulder top to an oversized sweater. We got back from Nashville last night and I'm already missing it! We loved it there so much. I can't even begin to tell you how good it was to get away from work and stress for a few days and not worry about checking email. 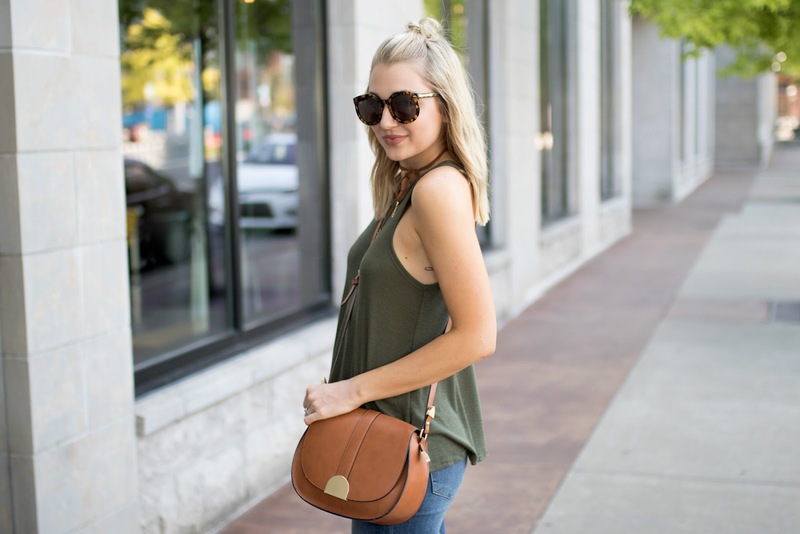 Between both work and blogging, email can become one of my least favorite things ;) We shot this outfit in an adorable area called The Gulch before grabbing brunch at Biscuit Love (so ridiculously tasty)! I'm working on a travel diary post of everything we did and ate, and can't wait to share it all with you!